Quorum onQ appliance was engineered from the ground up to provide enterprise level Disaster Recovery Solution without the complexity or cost of traditional solutions. onQ One-Click Recovery puts all of your applications and data back online within minutes of a storage, system or an entire site failure. Deploy onQ to meet your needs—locally for High Availability (HA), remotely for Disaster Recovery or both as well as Hybrid Cloud Disaster Recovery Solution. At Quorum, we know that every business is only as strong as its data is safe, and that even a minor disaster can spell trouble. Our suite of products are designed to make sure that you maintain data security and business continuity even in the face of a disaster. Speedy, efficient, and comprehensive recovery are vital to you, and our award-winning and patented Disaster Recovery as a Service (DRaaS) systems make you have them. Quorum products handle testing, data security, and disaster recovery. Our business is keeping your business open no matter what the circumstances, and our suite of products do just that. Find out which Quorum products are best for you! onQ Flex is an extension to Quorum’s award-winning and patented onQ Disaster Recovery as a Service (DRaaS) product that delivers the world’s most advanced High Availability and Disaster Recovery when you need it. Quorum’s Disaster Recovery on Demand technology offers customers the ability to spin up recovery nodes in the event of a disaster. onQ Flex combines Disaster Recovery on Demand and Instant Disaster Recovery capabilities to deliver priority recovery of mission critical servers. onQ Flex is the only product on the market that offers Disaster Recovery on Demand and Instant Disaster Recovery giving customers the same benefits as a replicated datacenter, in a simple and powerful way at an affordable cost. 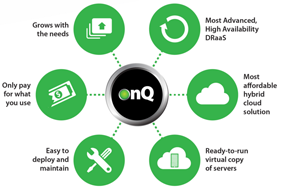 onQ On-Site is the building block of our HA, DR, and DRaaS capabilities. onQ On-Site maintains up-to-date ready-to-run virtual machine clones of your critical systems that can run right on the appliance, transparently taking over for failed servers within minutes. onQ supports deployment options to enable granular data backup and recovery, local HA, DR with a pair of appliances and One-Click Recovery via synchronization with Quorum onQ Plus. Unlike other cloud solutions, onQ Plus is a current virtual copy of any server – always on and ready-to-run. Additionally with onQ Plus, daily tests are performed automatically on the servers. Because of cost and complexity, these tests are most often not ever performed with traditional back-up cloud solutions. Quorum onQ Archive Vault provides customers with the ability to create long term archive backup of their critical data. The Archive Vault solution assists organizations with compliance needs as well as increasing operational efficiency, mitigating risks and enables litigation readiness. RecoverWorks.com is a division of Virtual Graffiti Inc, an authorized Quorum reseller.